A new ABC/Washington Post poll is out, and it shows Obama ahead nationally among likely voters 49 percent to 46 percent. That’s not too surprising, but what is surprising is that the poll shows no post-debate surge for Romney. Obama was ahead by two points on September 29 and he’s ahead by three points today. 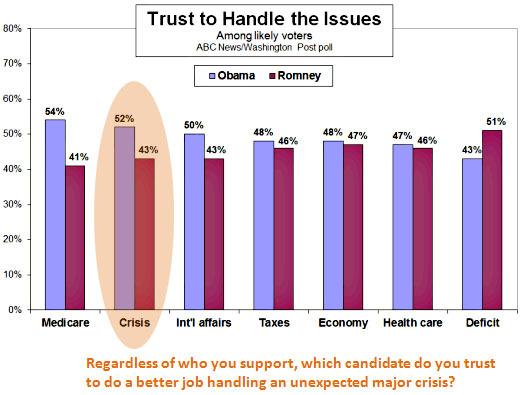 More interesting is the chart below, showing that Obama outpolls Romney on every specific issue except for the deficit—which certainly attests to the power of brand management, since there’s really no good reason to think that Romney would be any better at reducing the deficit than Obama. Quite the contrary, in fact: Romney has given us every reason to think that his real priorities are cutting taxes and raising defense spending. Aside from that, though, what I found most intriguing was the very strong belief that Obama would be better at handling an unexpected crisis. The “no-drama Obama” schtick might not work so well in a national debate, but in real life it sure seems to be a winner.